Eco Tech provides affordable, safe and effective mold removal in Camden County. We use the latest mold removal, mold cleanup and mold testing equipment and processes for residential and commercial environments. Our team provides rapid response in emergency situations, quality assurance and third party analytical laboratory services. If you worry about possible mold growth in your home, contact Eco Tech for mold inspection in Camden County. Mold Inspection Camden County – Why is there Mold in My Basement? Basements are one of the first places Eco Tech inspects while performing mold inspection in Camden County, due to the combination of moisture and mold food sources. Mold grows much faster in your basement than the rest of the house, due to the higher levels of humidity and lack of ventilation. It’s crucial to check for leaks or gradual seepage of water. Basements are often filled with prime food sources for mold. Mold can eat through wood framing, basement insulation, sheetrock, furniture, cardboard boxes—essentially any organic material. 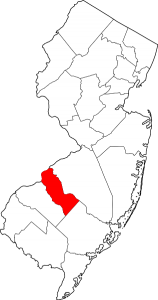 As we perform mold removal in Camden County, we inform homeowners about the reasons mold growth and water intrusion. Often, water seeps through the basement floor or walls due to hydrostatic pressure. Water may enter the home via clogged gutters, a failed sump pump or leaky window wells. You may experience a leak, but not address it in time, giving mold a chance to grow. There may be excess water in your basement due to condensation on pipes or window frames, especially during colder months. If you do laundry in your basement, the high levels of humidity could encourage mold growth. Our experts who perform mold inspection in Camden County can help identify the source of your mold problem, eliminate it and advise you on how to prevent future mold infestations. Please contact Eco Tech at 856.833.1030 to learn more.